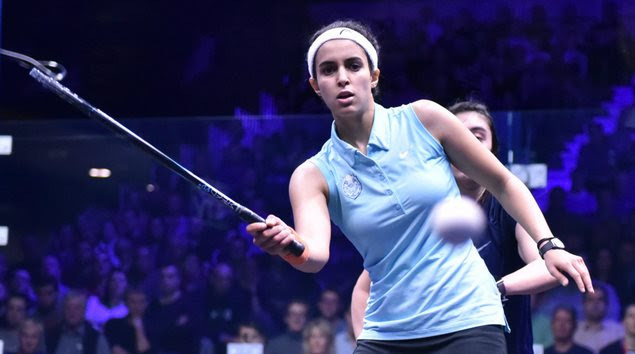 According to the latest Rankings released by PSA, in the Women’s category, Egypt’s Nour El Tayeb has moved into the world’s top three for the first time in her career. El Tayeb moves up four places courtesy of a semi-final placing at the inaugural Saudi PSA Women’s Squash Masters earlier in January which she followed up with a runner-up finish at the J.P. Morgan Tournament of Champions to continue a rich vein of form that also saw her capture the U.S. Open in October. The 24-year-old Egyptian fell just short of clinching the Tournament of Champions title in New York as she was defeated by compatriot Nour El Sherbini – who retains her place at the top of the Women’s Rankings for the 22nd successive month ahead of World Champion Raneem El Welily (No.2). 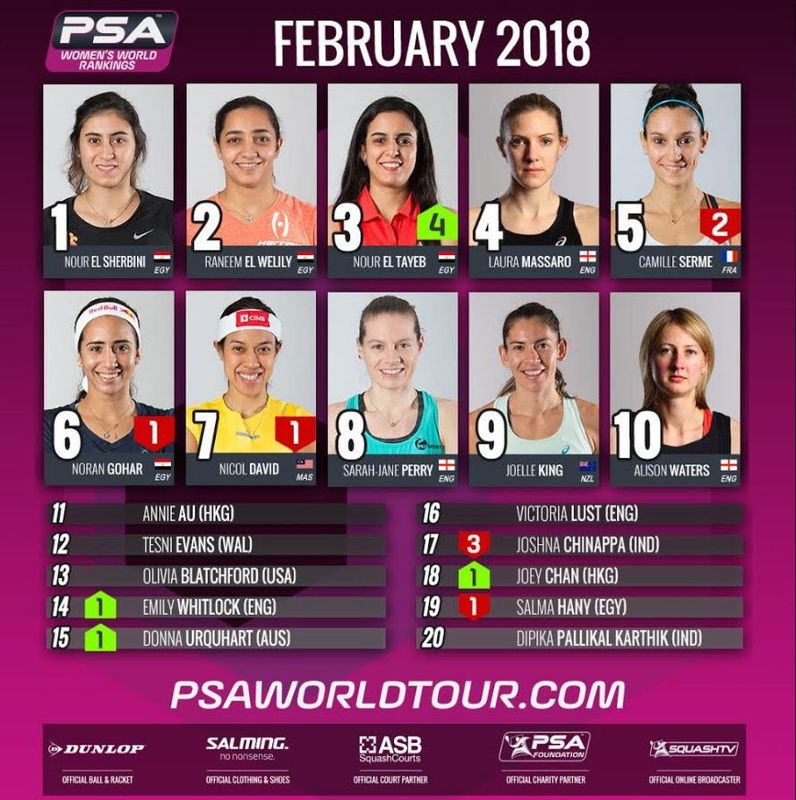 El Sherbini enjoyed a formidable start to 2018, lifting both the Saudi PSA Women’s Squash Masters and Tournament of Champions titles to take her tally to five titles so far this season to extend her lead at the top of the rankings.Meanwhile, England’s Laura Massaro stays at No.4, while France’s Camille Serme drops to No.5 for the first time since December 2016. Egypt’s Nouran Gohar and Malaysia’s Nicol David both drop a place, down to No.6 and No.7, respectively, while England’s Sarah-Jane Perry, New Zealand’s Joelle King and England’s Alison Waters complete the top ten. Hong Kong’s Annie Au (No.11), Wales’ Tesni Evans (No.12) and American Olivia Blatchford (No.13) all remain unchanged, with England’s Emily Whitlock and Australia’s Donna Urquhart both rising a place to round off the top 15. Elsewhere in the top 20, England’s Victoria Lust remains at No.16, while India’s Joshna Chinappa drop three places to World No.17, Hong Kong’s Joey Chan (No.18) and Egypt’s Salma Hany (No.19) swap places and India’s Dipika Pallikal Karthik completes the top 20. The United States’ Amanda Sobhy – who made her return after a ten month injury lay-off in New York last month – drops two places to No.30. As for in the Men’s category, Germany’s Simon Rösner has returned to a career high World Ranking of No.6 following his J.P. Morgan Tournament of Champions victory . Rösner lifted his maiden PSA World Series title last week in New York to become the first ever German squash player to lift a World Series title. 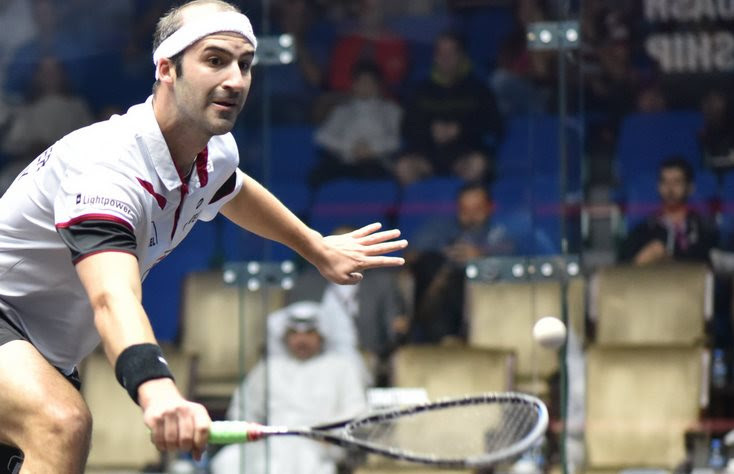 The German saw off Egypt’s Tarek Momen in the final to seal and historic victory, which sees him rise two places to a joint career high World Ranking of No.6 – which he last held in 2015. France’s Gregory Gaultier remains at the top of the Men’s Rankings, with Egyptians Mohamed ElShorbagy (No.2) and Ali Farag (No.3) completing an unchanged top three. Marwan ElShorbagy (No.4) and Karim Abdel Gawad (No.5) swap places to round off the top five, with the younger ElShorbagy brother claiming a career high ranking this month. Tournament of Champions runner-up Momen remains at No.7, with England’s former World No.1 Nick Matthew falling two places to No.8. 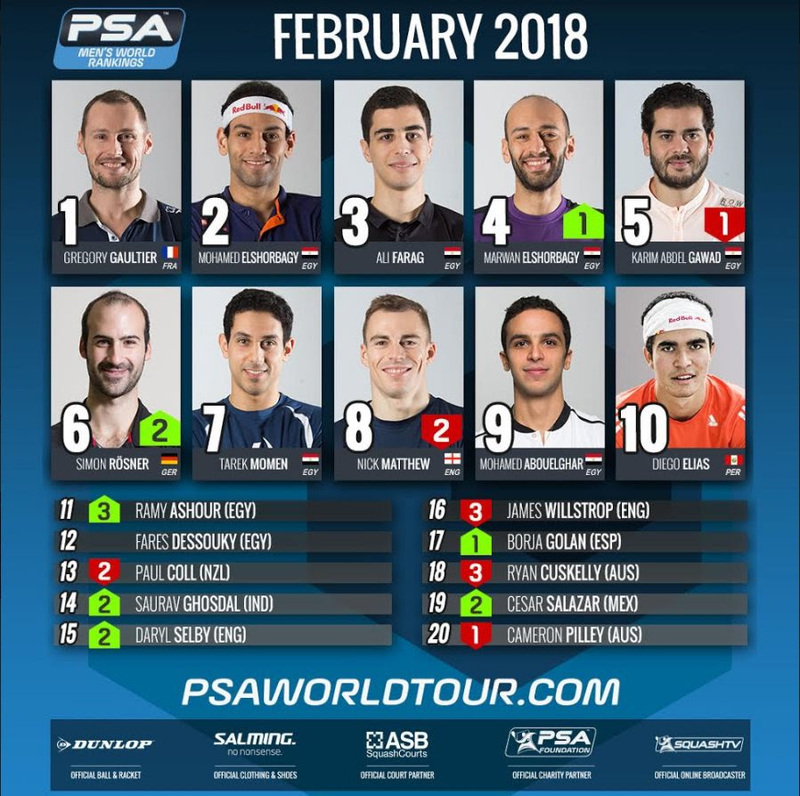 Mohamed Abouelghar and Diego Elias come next at No.9 and No.10, respectively, to complete the top ten while three-time World Champion Ramy Ashour rises three places to No.11 as he edges closer to a return to the top ten. New Zealand’s Paul Coll drops two places to No.13 with India’s Saurav Ghosal on the rise this month as he claims a career-high ranking of No.14 – with England’s Daryl Selby completing the top 15. Former World No.1 James Willstrop and Australia’s Ryan Cuskelly both fall three places to No.16 and No.18, respectively. With Spain’s Borja Golan(No.17), Mexico’s Cesar Salazar (No.19) and Cameron Pilley (No.20) all rounding off the top 20.